Der Artikel Howard Pollack: Marc Blitzstein: His Life, His Work, His World wurde in den Warenkorb gelegt. Ihr Warenkorb enthält nun 1 Artikel im Wert von EUR 56,84. Award-winning music historian Howard Pollack's new biography of Marc Blitzstein deftly captures the fascinating life and career of an American composer who was openly gay and Marxist at a time when neither was acceptable to the American public. 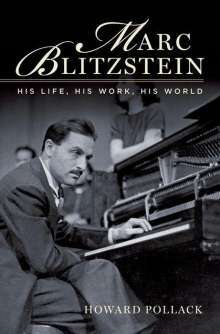 The first biographer to deal with Blitzstein's music as well as his life, Pollack delves deeply into the Blitzstein's life, uncovering new details about his marriage to novelist Eva Goldbeck and his compositional process. Beautifully written and meticulously researched, this book is a must-have for any fan of Broadway or American music.